Afrikans were also enslaved in Canada! Today we gather to commemorate the 178th anniversary of the abolition of chattel slavery throughout the British Empire. The Slavery Abolition Act of 1833 was the legal instrument that abolished slavery throughout the British Empire on August 1, 1834. 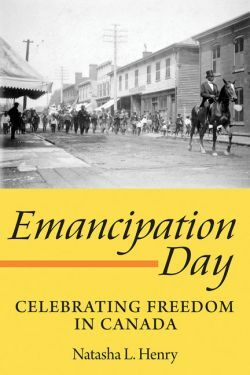 However, it was the Emancipation Rebellion of 1831/1832 in Jamaica that forced the British Parliament to immediately address the question of ending slavery. This victory over chattel slavery by enslaved Afrikans was a partial one. The formerly enslaved Afrikans had to continue working (45 hours per week) without wages for their former masters under the Apprenticeship System. Only children under six years of age were fully emancipated. The Afrikans resisted the free labour regime and the British politicians were forced to end the apprenticeship scheme and declared full emancipation on August 1, 1838. We are here to acknowledge the unquenchable thirst for liberation and the triumph of the human spirit that led enslaved Afrikans to use overt and convert tactics against the institution of slavery. Consistent with that tradition of struggle, our presence here is a recognition of the need for self-determined resistance to all systems of oppression including sexism, homophobia, ableism, racism, imperialism, colonialism, capitalism and transphobia, just to name a few. Dr. Martin Luther King accurately captures the broad spirit of solidarity that is needed to complete the Emancipation Project, “Injustice anywhere is a threat to justice everywhere. We are caught in an inescapable network of mutuality, tied in a single garment of destiny. Whatever affects one directly, affects all indirectly.” Sisters and Brothers, the work of full emancipation is still with us and today’s commemoration is a time for the renewal of commitment to participate in movements for social justice and the rededication of our lives to not be silent in the face of exploitation. When Africans left the system of chattel slavery, they entered the wage slavery system of capitalism, which is similar in its exploitative and soul-destroying features as the one that they left behind on August 1, 1838. We are members of the working-class in Canada. We can share our own stories of the way that our labour is cheated, abused, disrespected, brutalized and dumped when no longer needed. Those of us who are Afrikans or racialized are fully aware of the existence of racism in the workplace, labour unions, government bureaucracies and state agencies. Emancipation was all about Afrikan labour asserting its humanity and self-worth. Today we need to fight for employment equity legislation with accountability measures and firm employment-related targets, push for measures that will punish racist harassment and abuse in the workplace, stand in firm solidarity with migrant workers in factories, farms and homes and to challenge the racism that exists in the Canadian labour movement. Canada’s migrant farm workers’ program, Live-in Caregiver Program and many other temporary foreign workers’ programs continue to exploit migrant workers who are usually Afrikans and other racialized peoples. Most importantly, we must stand in solidarity with the indigenous peoples of this land who are fighting to reclaim their right to self-determination over their territory. We thank you for gathering today to not only remember our histories but to also mark and fight back against the multiple ways in which oppression continues to exist. When we commemorate Emancipation Day, we commit ourselves to remembering the revolutionary Afrikan ancestors who evoke our legacy to continue and strengthen the consistent and persistent resistance to all forms of oppression.